Inject some thrills into your standard sightseeing adventure and whip through the Southland forests at high speed on this thrilling jet boating experience. 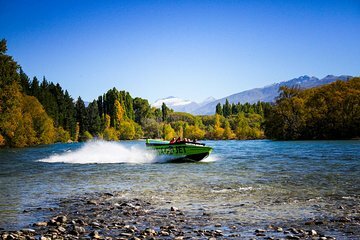 Race around Lake Wanaka and down the winding Clutha River, through rapids and tunnels, tight channels and tighter corners, on this compact and comprehensive journey that’ll get you back to shore in time for your afternoon or evening plans. Travel the river at rocketing speeds of around 50mph and enjoy remarkable stunts like the 180-degree Hamilton Spin!